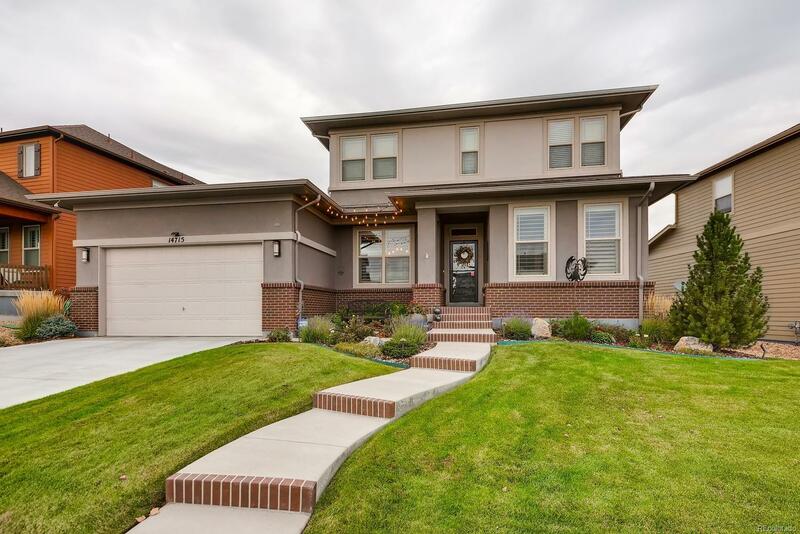 Meticulously maintained main floor master, 3 Bed, 3 Bath home. Wonderful open floor plan with custom finishes throughout. Hand troweled walls, hardwood floors, plantation shutters on main level, 8 ft doors throughout. Gourmet kitchen w/granite tops, staggered cabinets, under/over cabinet lighting, SS appliances & hood vent, walk-in pantry, large island, dining nook with Barn Wood wall. Beautiful 2 story great room w/designer lighting, gas fireplace, in wall speakers. There is formal dining room, study, powder room w/tile wall, laundry room. The master suite w/coffered ceilings, a 5 piece master bath with 2 walk-in closets complete the main level. The upper level features 2 large bedrooms, full bath and loft. Large basement w/Radon Mitigation, 2 lg crawl spaces for indoor storage. Outdoor Colorado Room w/remote shade screen, generous patio w/Marblelite coating, stone fireplace, dining/bar area w/built in BBQ grill, outdoor speakers. 3 car tandem garage w/cabinets & overhead storage.